Rutile Quartz is one of the best Natural Gemstones that we are manufacturing and selling. 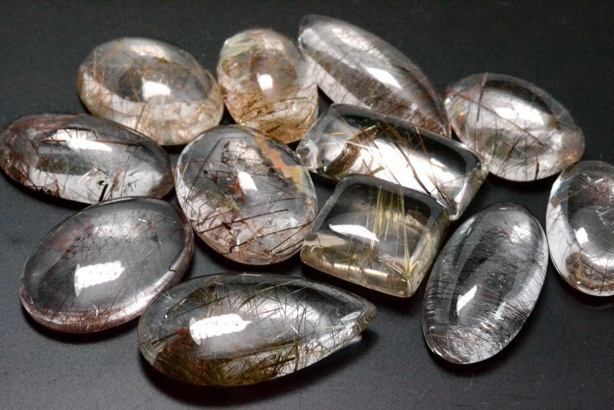 Rutile Quartz comes in Black, Golden, Copper, Yellow etc. colors. This amazing natural gemstone appears to be man made because of its beauty. The “needles” or “hair” inside rutile quartz are really magical. This article will cover the following information about Rutile Quartz. Navneet Gems and Minerals has been working in the Gemstones Industry for the last 20 years. Our prices are competitive with very fine quality supplier because of our own manufacturing units of Gemstones in India and in Thailand. We have a direct source of rough Rutile Quartz from Brazil, Sri Lanka, India, Africa and from other countries. We have many different qualities in Black Rutile Quartz, Golden Rutile Quartz, Rutile Quartz Cabochons. We import rough from brazil and then manufacture Calibrated and Free-Size in different colors. A long time before we were only dealing in Precious Stones but when we visited Brazil, we saw this amazing stone and starting manufacturing it ever since then. This stone comes in many colors like Black, Golden, Copper, Yellow etc. The Quality Factor is with needles or hair inside the stone. If the stone is heavily loaded with hair or needles inside then it is not a sign of good quality but limited needles with proper arrangment makes it elegant. When we talk about the sizes then it comes in calibrated to free sizes. Big sizes are more popular because of its use in Jewelry as pendants. Different cuts and shapes are available in all colors like Faceted, Cabochons, Flat Bottom, Round, Pear, Marquise, Octagon, Square, Oval and other shapes are available in all colors. The most interesting fact about Rutile Quartz is that Rutile is the only Semi Precious Gemstone that is valued for its inclusions. Limited Needles or hair inside the stone gives a fascinating look. This stone is very very cheap when it comes to its natural beauty. Prices start from 0.07$/carat and go higher according to quality. Big size Rutile Quartz Gems are cheaper than Calibrated Rutile Quartz because of the low cost in production. We are selling lots of a thousand carats and at very minimal prices. These are sample pictures sent by our Loose Rutile Quartz Customers who are Jewelry Makers. Mainly we have customers from the USA, the UK, Asia and Australia. We thank our customers for giving such an elegant look to loose Gemstone Jewelry with our gemstones. 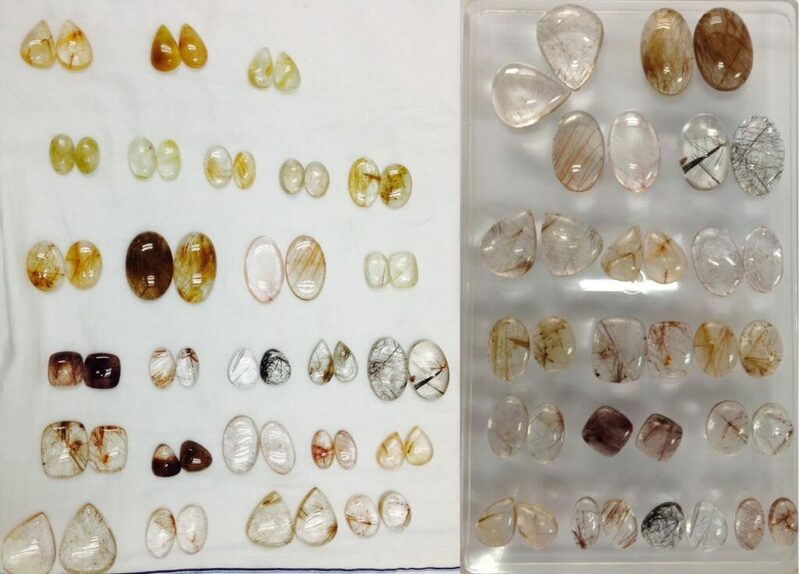 Here are the pictures of pairs of Rutile Quartz Loose Stones in different shapes. 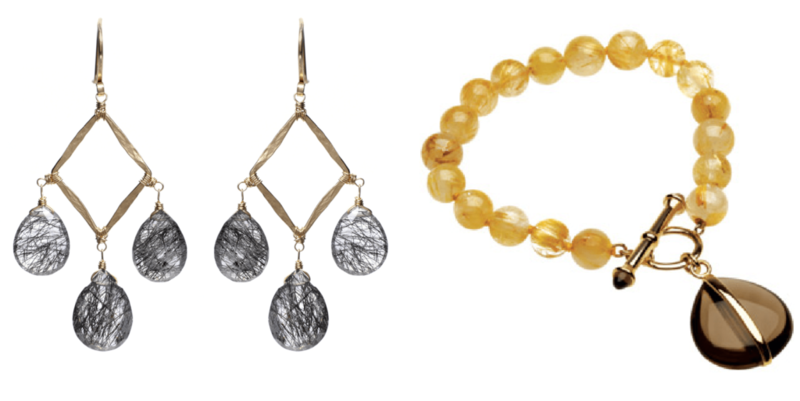 Now-a-days Rutile is one of the most famous Semi Precious Stones after Garnet. The different look of this natural Gemstone and its cheap price makes it popular. 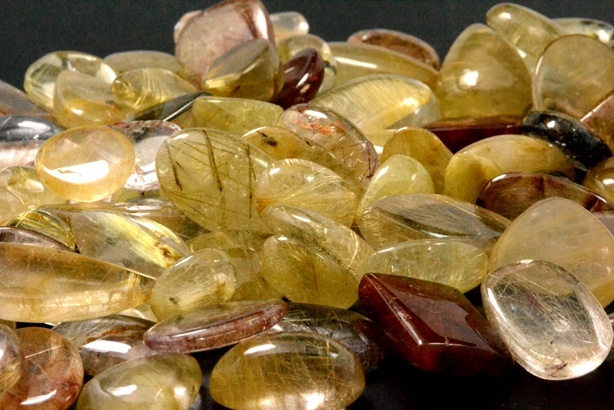 The Sri Lankan material of rough rutile is gone and now no more is in the market. The Chinese are using up all the rough and buying in big quantities but our company Navneet Gems has a big stock of more than 50 kilos and so we can do well and supply good Sri Lankan as well as Brazilian quality of rutile. Contact us to buy loose Rutile Quartz in Black, Brown, Copper, Yellow and other colors. You can email us or call us anytime. We will get back to you with in a few hours.